The media, wanting so desperately to say something nice about Donald Trump, seemed to go out of their way to praise the president for his performance before a joint session of Congress last week. Trump seemed to find the right key to being presidential. Like maybe he finally gets it? The president this weekend made it clear he has no intention of raising his rhetorical game as he took the bombastic remarks of a conservative talk host as fact, and then made an outrageous charge: that President Barack Obama had wiretapped phones in Trump Tower. Uttering a falsehood is pretty bad. When you’re president, it’s worse. Trump’s status implies there’s some truth, even though there’s no factual basis for any wiretapping claim. Obama’s spokesperson unequivocally denied the claim. But Trump’s tweets live on as more of the same wrongheaded, low-minded rhetoric he launched on Friday, when Trump tweeted pictures of Democratic leaders Schumer and Pelosi with Putin and then suggested an investigation be launched on both! We are now officially at 6th grade level with the U.S. presidency. And you thought Hillary Clinton warning about The Donald’s access to nuclear codes was bad. When the president relies on hurling dog feces as fact, no one is safe. We are watching the degradation of the presidency before our very eyes. But it’s what we get when the country elects a birther president, who likes to polarize the country and undermine democracy with fake news. Angie Kim saw Trump live at the joint congressional session last week when many people thought the president finally realized he was president. 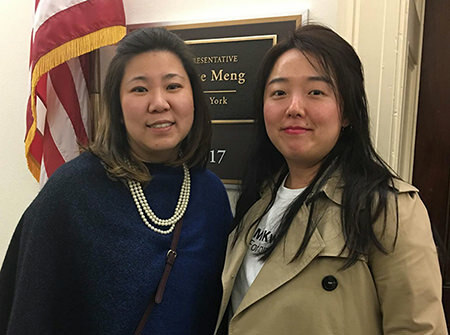 Kim, a community organizing fellow at the MinKwon Center for Community Action in Flushing, New York, was the guest of Congresswoman Grace Meng. Brought to the U.S. at age nine by her parents from South Korea, Kim qualified for President Obama’s Deferred Action for Childhood Arrivals (DACA) program in 2012. It gave her the right to get a work permit and stay in the U.S.
Now 32, her future is in jeopardy, as President Trump has had a conflicting strategy on immigrants. Trump’s tough on what he calls the “bad dudes,” but he says he has some heart for DACA recipients–even though he has yet to say anything definitive. In fact, DACA recipients have been included in roundups during the new ICE policies and have been set for deportation. On our podcast, Kim gives an undocumented person’s view of the president and his speech, from the policies to the use of manipulative props in the audience. Kim wasn’t a prop. But she told me she felt “powerful” in the chamber, and that being there allowed her to lose the fears she has over being undocumented. She admitted she has often been afraid of deportation through the years. “My heart would also be broken if I were separated from my family as an adult,” she told me. Bu he said working on behalf of immigrants at MinKwon has helped her deal with that fear. “I didn’t need Trump’s address to be an affirmation for me,” Kim said, but admitted her “emotions were stirred up” by hearing Trump’s speech. Kim said she left Capitol Hill inspired to work even harder for her immigrant community’s fight for justice. Listen to Angie Kim, interviewed on my podcastbelow.